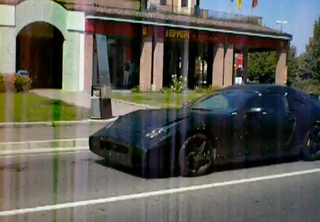 This long-nosed Ferrari prototype was recently filmed yowling around Maranello. It's wearing the headlights of a 458 Italia, the rear glass of a 599 Fiorano, and enough camouflage to cover half of Europe. Unsurprisingly, it sounds fantastic. We don't know much about what's going on here, but we can surmise a few things: Based on the proportions, the car is likely front-engined. Judging by the sound, it's equipped with a V-12 and a twin-clutch gearbox. The hump on the rear could represent a folding hardtop, or it could just be an excess of camo. The 612 Scaglietti is next in line for replacement, so unless something weird is going on, this is probably that car's successor. Random trivia: This was taken right in front of the Ferrari factory gates in Maranello. The store across the street is the factory gift shop (you can see the yellow company logo on the roof), and one of the factory walls can be seen to the left at the video's end. Maranello is a pretty small town, and you can drive across it in a few minutes. The last time we were there, F1 cars were testing at Fiorano, and kids who had just gotten out of school were climbing the fences around the track to watch. Ahh, Italy.